The Scottish Salmon Company (SSC) is to invest £10 million in its operational infrastructure as a result of major new freshwater projects. A new facility in the Applecross estate in Wester Ross, Applecross Kishorn, is due to be completed in 2020 and will create a centre of excellence in freshwater production, which the firm says reinforces their commitment to innovation and best practice. SSC has also acquired two freshwater facilities in the area. These include on-shore hatchery Appleburn Couldoran and a nearby facility at Loch Damph, which will support increased smolt production as the business continues to deliver its ambitious strategy for responsible, sustainable growth. 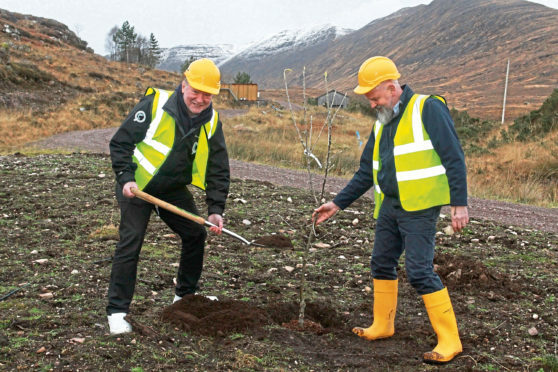 To mark the new developments Applecross Kishorn and Appleburn Couldoran, SSC’s chief executive Craig Anderson planted Scottish heritage apple trees at both sites. The new investments are part of SSC’s ongoing commitment to Scotland’s rural communities and economies, and will provide long term job security for 21 skilled full-time members of staff. They follow record results for the company in 2018, that saw revenues reach £180.1m and export volumes hit more than 60% of sales with particular success in key export markets North America and the Far East. Mr Anderson said: “We are making a significant investment in the Highlands and Islands which will strengthen our freshwater operational infrastructure and deliver greater capacity to meet the increasing global demand for our quality Scottish salmon.